Dr. Siegel and the entire staff at Attleboro Veterinary Clinic understand that the decision to allow your beloved companion to undergo surgery is never an easy one. 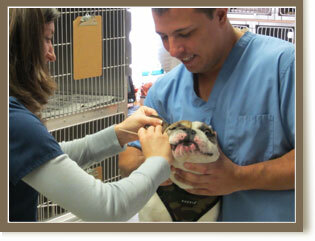 We strive to ensure your pet's procedure is as comfortable and stress-free as possible. Perhaps the most important pre-surgical step is to discuss why we believe a particular procedure is necessary and what it entails. Dr. Siegel will provide you with information on proper postoperative care and answer any questions you may have so that you feel comfortable knowing you are making the right choice for your pet. Our board certified surgeon frequents our hospital regularly to provide orthopedic surgeries such as ACL repairs, fracture repairs, and joint surgeries for our patients. Our Attleboro Veterinary Clinic's surgical technicians' sole job during surgery is to constantly monitor your pet's vital signs. They also continuously interface with the surgeon to adjust to any changes occurring in your pet's health. The vast majority of surgeries that we perform do not require an overnight stay; we strive to return your pet back home as soon as possible after surgery, usually that same evening! We all know that pain hurts, but pain also has many other detrimental effects on your pet's body. Pain slows healing, decreases activity, and causes behavioral changes such as aggression, anxiety, and depression. Pain worsens diseases like arthritis and potentially some cancers. It interferes with the bond between you and your pet. At Attleboro Veterinary Clinic, we practice the most up-to-date pain management protocol. For acute and chronic conditions, we use all our available and safe resources, including NSAIDs (non-steroidal medications) and oral and injectable analgesics for the complete comfort of your pet.